What do optical components and glass fibers in photonics, mobile devices, and high-quality wristwatches all have in common? In all cases, the objective is precision positioning of the individual components, parts or workpieces during assembly and in most cases, on several axes. If these workflows are fully or partially automated, the process is dependent on signals from external sensors, cameras or machine vision solutions. Therefore, it should be possible to easily integrate the positioning system into the higher-level automation system. The so-called hexapods, six-axis parallel kinematic positioning systems, are predestined for this purpose. They are able to position with micrometer accuracy. Thanks to their high stiffness, there is practically no settling time when the position has been reached. They position the loads, which means the components, camera systems or optical fibers, on six axes in space, three linear and three rotary. 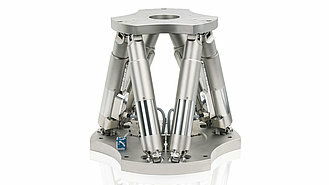 Due to their parallel-kinematic design, hexapods require special control. This is why they are supplied as a complete solution with a high-performance digital controller. The user enters the drive commands as Cartesian coordinates and the controller performs all calculations necessary for the parallel-kinematic six-axis system by transforming the Cartesian target positions into control of each individual drive. 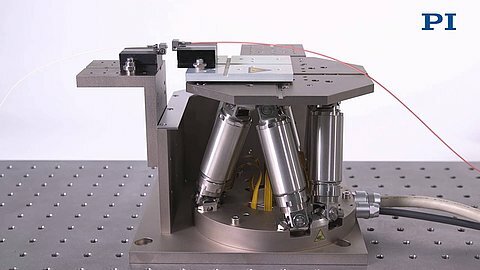 With the exception of the hexapod axes, the digital controller is also able to control two further axes, for example, linear stages for rough positioning over long travel ranges or a rotation stage for 360° motion. Easy connection of a higher-level control system is also possible. The PLC can then communicate with the Hexapod system, for example, via EtherCat. As master, it specifies the target positions or trajectories as Cartesian coordinates in space and also reports the actual positions back to the Fieldbus interface. The hexapod controller then acts as an intelligent drive with respect to the PLC. The parallel-kinematics principle used by hexapods can also be used for other purposes: The SpaceFab principle is based on three XY stages that position a platform together using three struts with a constant length and a suitable joint configuration. This makes it possible to realize fast and high-precision travels. Products from the SpaceFAB series are so small that they can be easily placed on the palm of the hand.